Looking into a custom event app? At Guidebook, we see people using apps for everything — but that’s because our platform has been constructed in a flexible way that empowers people to create apps for anything from expos to sales meetings to baby showers (the possibilities are endless!). Because of the wide array of apps we see created every day, it’s clear to us that people want to share information on their mobile devices. In fact, we find they’re desperate for a way to be able to deliver content to their co-workers, attendees, and friends right onto the thing that everyone has with them all the time – their phones. An understandable first conclusion would be that you’re going to have to hire some developers and spec out a custom event app that would do all the things you want it to do. After all, you’ve got specific needs and this seems like a custom job. Besides, how hard can it be to build an app. There are a million of them, right? That’s a good first step. Thinking this way will get you brainstorming what it would take to put together an app and what’s included in your “must haves” list. It also gets you in the mindset of taking the content you know you want in the app and structuring it into some sort of navigable format. There are schedules, lists of things, maps, instructions – and they all are connected in different ways. The good news here is now that you’ve thought it through, you’ve done a significant portion of the work that needs to be done. So before you pick up the phone and call your neighborhood app developer, make sure you know what’s involved in app development and what your alternatives are. You’ve thought it through and you have the app in your mind’s eye – now all you have to do is get someone to build it for you. It’s good to be aware of some of the difficulties you might encounter on the path to having your own custom event app. No matter what, with custom event app development your vision is going to be translated through the developers. Some developers are better than other at taking notes from their clients and creating exactly what they were expecting. More likely than not, there’s going to be a long and detailed iteration process where you are walking the development team through the product you’ve dreamed up and they’re trying to give you the best approximation of whatever it is you’re describing. This step alone can be enough for most to throw in the towel on custom app development. The reality is that you know best what you’re trying to build, and you should have a hand in building it. If your app is for a specific event or series of events, it goes without saying that you’re going to have a strict deadline baked into the project. App development takes time. More often than not, it takes a lot of time. Any sort of custom event app development would need to be started very far in advance – a least a year before the beginning of the event itself! Custom app development takes one more thing out of your control in this sense. You’re not always going to know when your product will be ready to roll, and the unpredictable schedules of app development might end up being the app’s eventual downfall. The obvious downside of custom event app development is going to be the exorbitant cost. So in addition to unclear timelines and the possibility of not representing your original vision correctly, layer on the added uncertainty of just how much all of this is going to cost and you’ve got one big expensive risk on your hands. Let’s keep in mind that your custom event app will also need maintenance and development is never done, especially from year to year and event to event. Going custom can mean recurring revenue on your developer’s part and out-of-control budgets on yours. The truth is that you won’t be making anything that anyone hasn’t made before, but it will seem that way while you’re doing it. You’ll have to think through problems as if it were the first time every time, often replicating work that other events and companies have done before you. If you’re going to go through the trouble of creating this tool for your attendees, you’ll want to benefit from everyone else’s work on similar projects. That’s why, at the end of the day, the best choice is always going to be to go with a tried and true event app. So building an app from scratch might not be ideal, but the good news is that plenty of people have done a lot of work to figure out an easy solution for you. At a company like Guidebook, we want it to be very simple for people to create their own apps. So simple that anyone could do it. Here are a few reasons you can get all the things you want out of your custom developed app with a ready-made solution like Guidebook. From the content you’re adding to the app to how it looks, you are going to control the app from the start. Guidebook never tells you what you have to include. If networking is what you want, we empower your attendees to network. If it’s all about people building custom schedules, we allow you to build custom schedules. Check out a list of our features here. From there, you can then arrange the information in the app in a way that will be best suited for attendees. You’re never stuck with a layout or configuration that you don’t like. If you’re stuck or you’re looking for best practices on a certain feature, you can always call up Guidebook or look through our bevy of helpful support articles. We’d be thrilled to help you out. 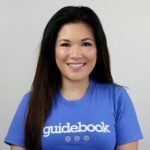 As long as you’re using Guidebook, we’ll be here to make sure that you and your attendees are getting the most out of it. With an app developer that may not be the case. After they’ve delivered your product they may not have any incentive to return your calls, unless they’re being paid to do so (the more likely scenario). When something breaks within your custom event app it’s going to take development time to fix it – and that adds up to more dollars on your end. It would be silly to put all this work into a single-use app. We’re guessing you’ll want to use the same app year after year at your event or for multiple events throughout the year. With Guidebook you can just duplicate a guide any time. Imagine the hours you can save after you’ve created that basic structure! As you speed up your app building, you’ll get in a groove and start wanting apps for everything. And with a platform like Guidebook, that’s a possibility! Just duplicate one you’ve already made and get building with a leg up. Guidebook is a platform. That means you can build whatever you want with it. We just give you the tools. Using Guidebook doesn’t mean that you have to sacrifice your brand or event structure – just mold the app to meet your needs. Custom icons alone can take a standard app and make it fit in with every other element at your event. If you’re looking for the ultimate in customization, however, Guidebook’s white label service might be the best option for you. You’ll get your own app in the app stores, custom created to your design specifications, with all the power of the Guidebook platform behind it. And it’s still cheaper than paying a company to build you a custom event app! If you’re still thinking that going completely custom is an option for your organization, take a spin around our content management system and start building an app for yourself. It doesn’t take very long, it doesn’t cost anything to sign up and start building and it’s a pretty low-commitment activity. After a few minutes of building, you’ll find that everything you were hoping to develop for yourself is already included right there. The benefit is that, by doing so, you just saved yourself a lot of time and money.